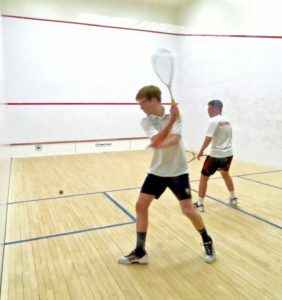 Days before both teams travel to the U.S. High School Team Squash Championships this weekend in Avon, Conn., Rye High made the one-mile trip to the Rye Country Day campus Monday to take on the Rye Country Day Wildcats. Coach Quan Huynh’s Garnets proceeded to take six of the seven hard-fought matches and come away with the mythical Mayor’s Trophy for the 2019 season. The home team had just earned a 7-0 whitewash of Trinity-Pawling 48 hours earlier, but they fell behind early when Rye’s Dylan Rodilosso swept Miles Chun at #4, 11-7, 11-3, 11-3. The Wildcats’ Andrew Felton won his first game over James Abt on the #2 court, but that was all she wrote. Abt got the win 9-11, 11-9, 11-3, 11-6. In the only match of the afternoon that went the distance, the Garnets’ Felix Nusbaum came from behind to beat Oscar Mindich at #6 by 11-4, 9-11, 12-14, 11-9, 11-6. Things didn’t go much better for the hosts when the odd-numbered matchups took the courts. William Mongillo defeated Henry Burdick in straight games in the #5 pairing by 4, 8, and 5. At #3, the visitors’ Rafay Syed beat Raif Shah in similar fashion by scores of 4, 5, and 9. Head Coach Alex van Langerhorst’s charges got their only win at #7 after the fourth game was tied at 10-all. 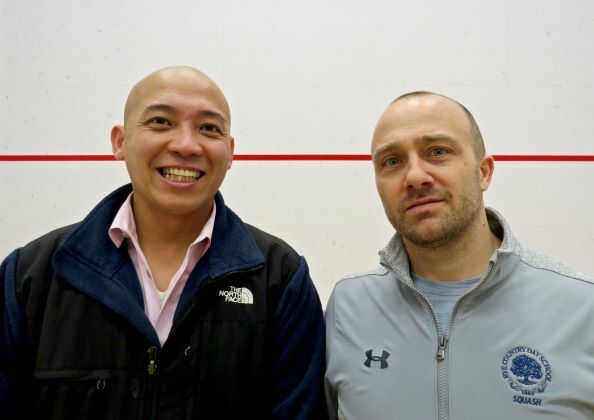 John Featherston prevailed in the see-saw matchup over Eddie Nakamura 5-11, 11-6, 11-9, 13-11. Not surprisingly, the #1 match between Liam Pope of Rye Country Day and Charlie Greenhouse of Rye featured the longest rallies and the best shot-making. After Greenhouse won the first game in extras, 12-10, he took the next two by scores of 3 and 7. Liam Pope of Rye Country Day lines up a backhand in the #1 match. The Garnets’ Charlie Greenhouse digs one out of the corner. The National Championships, played at Trinity and Wesleyan colleges as well as the courts of several schools in the Hartford area, comprise eight divisions of boys’ teams, based on their seasons’ records, and six divisions of girls. 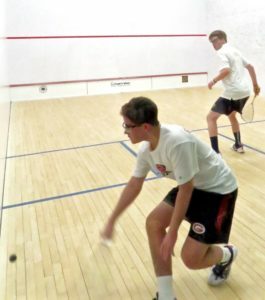 Both local teams will compete in Division IV Friday on the courts of Avon Old Farms School.